About 45 km. south of Karak on the King's Highway is Wadi Hasa, a deep gorge known in the Bible as the Zered Valley. There Moses and the Israelites ended their wanderings in the desert and camped on their journey north (Numbers 21: 12; Deuteronomy 2: 13-14). Just west of Wadi Hasa, the deep gorge that bisects the Kings Highway about 45 kilometers south of Karak, you will find the ruins of a great Nabatean temple. Known as Khirbet al-Tannur, the site was built on the edge of a steep bluff, and access is possible only from the southern flank. The temple dates back to the first century CE, and was probably dedicated to the deities Atargatis (goddess of foliage and fruit) and Hadad (god of the thunderbolt), although relics associated with a variety of gods and goddesses have been found at the site. Many of these can now be seen at Ammans Archeological Museum. Tafileh, a busy market town 32 kilometers south of Wadi Hasa, was part of the Crusaders line of defenses. A ruined Crusader fortress forms part of the landscape of this ancient town. During the Great Arab Revolt, Tafileh gained importance as the site of the only set battle Lawrence of Arabia fought during his campaign. The land running westward between Tafileh and Shobak was of great importance during Biblical days. Copper mining and metal smelting developed early there, and the inhabitants of the regionmost notably the Edomitesgained extreme wealth from the rich deposits of metals. This is yet another castle in the great chain of Crusader fortresses which stretches across Jordan. The stronghold, known as Mont Realis (Montreal), was constructed in 1115 CE by Baldwin I. At its height Shobak was home to about 6000 Christians. It suffered numerous assaults by Salah Eddin (Saladin) before it finally fell to him in 1189. Shobak Castle was then restored by the Mamluks in the 14th century. 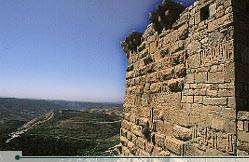 The castle is perched on top of a small hill northeast of the town of Shobak. Inside the fortress there are two churches, the first of which is to the left of the entrance and up the stairs. There are ruins of baths, cisterns and rainwater pipes, in addition to millstones for pressing olives, a few archways and other works which have stood the test of time. The caretaker can point out a shaft from which a set of stairs cut into the rock leads down to a spring below the castle. The shaft has 375 steps and is one of the deepest wells ever cut by Crusader forces. A side road leads to the castle from the Kings Highway about two kilometers north of Shobak village. From there it is another four kilometers to the castle. The rugged beauty and natural diversity of Dana make this nature reserve a worthwhile stop for visitors to Jordan. The reserve encompasses some of Jordans most breathtaking scenery, stretching from the 1800-meter-high Sharaa mountains in the east down to the dunes of Wadi Araba at sea level. Dana became the Kingdoms sixth wildlife reserve in 1990, thereby protecting all animalsincluding endangered species such as the ibexfrom the ravages of hunting. Next to the nature reserve is the small village of Dana. Artifacts uncovered there indicate that man has inhabited this area for six thousand years, drawn by the regions fertile land and natural springs. Olive trees in Dana. © Zohrab Dana Nature Reserve hosts a wide variety of fauna, including ibex, mountain gazelle, fox, badger, porcupine, wolf, hyrax, striped hyena, jackal and many others. Numerous species of birdlife roam the skies of Dana as well. Visitors to Dana are welcome to take advantage of the designated campground area and the hiking trails which crisscross the reserve. The rather luxurious campground offers meals, showers, guided walks around the reserve, and tents with mattresses and pillows. The reserve also operates a guest house with private terraces overlooking the spectacular scenery. It is a good idea to call ahead to make reservations (tel. 03-368-497). Dana is located near Qadisiyya, about 25 kilometers south of Tafileh and just north of Shobak on the Kings Highway.